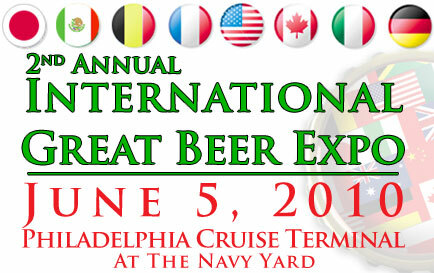 One again, the International Beer Expo will take place June 5 at the Philadelphia Navy Yard. The annual international beer tasting extravaganza, will showcase more than 75 breweries from across the globe, each providing samples of their country’s proudest brewing achievement. Shoulder to shoulder with some of America’s best breweries will be beer from Japan, Germany, Czech Republic, France, Jamaica, Greece, Spain, Belgium, Italy, Trinidad, Scotland, Cyprus, Nicaragua, Ireland, Israel, Poland, China, Peru, Canada and others. The event is produced by Starfish Junction, co-producer of the award-winning Philly Craft Beer Festival, selected as one of the “Top Ten Beer Festivals in America” by Forbes Traveler. “The event will feature more than 75 breweries. 70% of the breweries at the expo are from outside the United States. This will be a rare and wonderful treat for the attendees. They’ll get to try beer from some of the most talked-about international breweries, breweries like Brew Dog from Scotland, Elephant Beer from Denmark, and Coedo from Japan,” said event producer Andy Calimano. “We’ll also showcase beer from such exotic locations as Greece, Jamaica, Peru, and Nicaragua,” he added. The event will help raise funds for the CBC, Committee to Benefit the Children, a local charity that provides resources for treatment, care and family support to benefit area children with cancer, leukemia and serious blood disorders. To date, the Philly Craft Beer Fest and the International Great Beer Expo producers have proudly donated more than $43,000 to this local Philadelphia CBC charity. The International Great Beer Expo will have two sessions: 12:30-4:00 pm and 5:30-9:00 pm. Tickets, which are $45 each, include admission to the Expo, a souvenir tasting glass, and the freedom to enjoy a 2 oz. sample of any of the beers present at the expo. Designated driver tickets are $10 each. No one under 21, including designated drivers, will be admitted. All attendees must show valid photo ID for entry.